Once again, you couldn’t fault his workout, as he did everything smoothly and professionally, sitting two lengths off his workmate and cruising by him late under no urging. He won’t get a chance for a rematch with McKinzie, but will now have to contend with the much-hyped Justify, who is looking to emerge as the new king of California, and possibly the country. Bolt will now serve as a barometer to measure just how special Justify really is. However, according to the racing office, Ruis will also be running the maiden Orbit Rain in the Santa Anita Derby. Considering Ruis owns both horses and Orbit Rain has been out of the money in his only two dirt starts, going off at 56-1 and 83-1, and has no speed, one has to wonder about the reasoning behind this decision. It makes no sense. One thing that history has shown us is that any horse can cost another horse the race at any time. I call your attention to the 1931 Triple Crown. Greentree Stable’s Twenty Grand easily won the Kentucky Derby by four lengths. In the Preakness, he finished a fast-closing second, with the footnotes reading: “Twenty Grand was blocked by his stablemate Surf Board at the head of the stretch, responded gamely under punishment, and was wearing down the winner.” Twenty Grand went on to win the Belmont Stakes by 10 lengths. He no doubt would have been a Triple Crown winner had his stablemate not been in the race. And forgetting Bolt d’Oro, just imagine the outcry if Orbit Rain should bother Justify bad enough to cost him the race. We’ll just have to see where he draws and hold our breath at the start if he draws next to Bolt d’Oro or Justify. Doug O’Neill also is running a maiden, Jimmy Chila, but he at least has decent form and has run well against Restoring Hope and Nero. Regardless of any stamina question marks, of which there are several, he proved himself to be a gifted horse who looks as if he should be able to handle the extra furlong of the Kentucky Derby. But the Florida Derby was an oddly run race in that he was right where you thought he’d be early, then for whatever reason he just took himself out of the race, dropping about a dozen lengths back, which was very fortunate considering the suicidal pace up front that eventually would kill off everyone close to it. He did seem to get bumped a little early, but he just dropped the bit and retreated to the back of the back. Then when they straightened down the backstretch, he appeared to grab the bit again and began picking off horses. By the time he closed in on the leaders they were gassed, and he had no trouble drawing clear from recent maiden winner Hofburg. And with Catholic Boy bleeding badly and never firing, he basically ran out of out of competition. He still has a bit of a lazy streak in him, as he shows in his often feeble works, and he is still a bit green, as he showed by drifting out in the stretch. But with all that said, he proved a great deal on Saturday. I needed to see how he stretched out to nine furlongs, and he had absolutely no problem with it, rattling off a pair of middle quarters in :23 4/5 and coming home his final three-eighths in a solid :37 1/5 and final eighth in :12 2/5. What makes him so dangerous is that he has the ability to close strong from anywhere off a fast pace and sustain a long run, as he did in the Florida Derby. That is reflective in his Brisnet numbers, where has now earned three triple-digit late pace figures. No matter how he runs, he never seems to get tired, which sort of defies his pedigree, as his sire requires stamina from the dam to even get 1 1/16 to 1 1/8 miles, and his broodmare sire, Gilded Time, and Gilded Time’s sire, Timeless Moment, were both pure sprinters. But it seems he is bypassing Damascus’ speedy son and grandson and going straight to the old man, who could run a mile and a half to two miles without taking a deep breath. And he is also falling back on Belmont winner Easy Goer and Alabama winner Classy Cathy in his tail-female family. He reminds me of Smarty Jones with his brilliant cruising speed that he can carry a long way and being able to tap into the stamina far back in his pedigree. In short, this looks to be a very special horse, who is ready to pounce on that No. 1 ranking. It’s hard to find enough superlatives to do justice to his total decimation of the UAE Derby against what seemed to be a deep talented field. He ran like a budding superstar in his dirt debut, but the only question is, did he run too big a race? There didn’t seem to be any reason for Ryan Moore to ride him so aggressively to the wire, going to the whip and then vigorous hand riding in the final yards. Considering the travel from Ireland to Dubai and the travel back to Ireland and then to Kentucky, Moore might have been better served just letting the colt finish on his own and not pushing him to the wire. With a huge 106 Beyer speed figure, and a track record for the 1 3/16 miles, you have to ask if he will be able to maintain that form in five weeks. Of course, we could be dealing with a total freak of a racehorse, and even if he regresses a bit off this race, he still could have another big performance in him that is capable of winning the Derby. We saw a similar performance from Bellamy Road in the 2005 Wood Memorial, when he won by 17 1/2 lengths, earning a monstrous 120 Beyer figure, and he couldn’t come close to duplicating it in the Derby, finishing out of the money. Mendelssohn, as everyone knows by now, is a half brother to champion Beholder and top-class sire Into Mischief and cost a whopping $3 million as a yearling. Between this performance and Beholder’s spectacular romp against the boys in the Pacific Classic, I can’t recall a mare producing a brother and sister who turned in such mind-boggling performances. What is important is that Mendelssohn, who has already traveled far to win the Breeders’ Cup Juvenile Turf at Del Mar, adds even more intrigue to a Kentucky Derby already loaded with intrigue and budding superstars. Aidan O’Brien has supported the Derby on several occasions and certainly would be a deserving winner, especially with a colt having such strong American ties. O’Brien’s m.o. is to ship fairly close to a race, so don’t expect to see too much of Mendelssohn leading up to the Derby. It wasn’t too long ago that this was the colt most people thought was the next superstar, considering what he accomplished as a maiden in the Champagne Stakes and especially the Breeders’ Cup Juvenile, where he handily defeated Bolt d’Oro and Solomini. It looks like Brown is getting him sharp, working him a half-mile in company for the Blue Grass Stakes in a bullet :48 flat, fastest of 54 works at the distance. Everyone is getting excited about Mendelssohn and Audible, but let’s not forget he is still the reining champ and is one big effort away from either regaining the top spot or being right back up there in the Top 2. There is no doubt his star has dimmed following a disappointing third-place finish in the Fountain of Youth Stakes, where it looked as if he wasn’t nearly as race fit as most people thought. But that is why they run prep races. Promises Fulfilled and Strike Power, the one-two finishers of the Fountain of Youth, were obviously fitter and sharper, but have pretty much raced themselves out of the Derby picture by getting involved in a suicidal slugfest in the Florida Derby that left them staggering far up the stretch. We won’t have a true gauge of Good Magic until the Blue Grass Stakes, after which he will either ascend or plummet. If he is going to ascend, he will have to overcome breaking from post 11. With his running style, he is in jeopardy of getting hung wide into the first turn. So he will have to break sharply and get lucky or take back. Until then he still must be feared and respected. A future book bet before the Blue Grass at a decent price could be a very live ticket if he runs like the Good Magic of last year. He obviously bounced out of his impressive victory in the Rebel Stakes in great shape, as indicated by his bullet half-mile breeze in :48, fastest of 13 works at the distance. How can you sort out all these talented 3-year-olds when you can’t even figure out who is the best in Pletcher’s barn. And he still has more live ones next week. But as mentioned last week, this colt has been special from day one. Like several of these other brilliant upstarts this year, he has to overcome his lack of experience, and in his case, not having raced as a 2-year-old. But other than racing a little greenly, something he will have to correct in the Arkansas Derby, he showed the ability to race between two top-class horses, outrun them, and keep building up momentum. There is no doubting his high cruising speed and excellent tactical speed. What was a bit unusual was him drifting out in the stretch under right-hand whipping. Left-handed whipping one can understand if a horse shies from the whip. So we will watch out for that when he returns to Oaklawn Park in two weeks. But other than that he did everything the right way. The Rebel was the race he used to surge forward and establish himself as a leading Derby contender, so he doesn’t need to do anything spectacular in the Arkansas Derby, as he faces pretty much the same group he faced in the Rebel now that Justify is staying home. In his all-important work to determine his Santa Anita Derby status, he drilled six furlongs in 1:13 1/5 in company with the gritty Hoppertunity, with private clocker Andy Harrington getting him galloping out seven panels in 1:27 1/5. He broke off two lengths behind, took the turn about 5-6 wide, and was gobbling up the ground with those humongous strides, easing clear of Hoppertunity right after the wire. 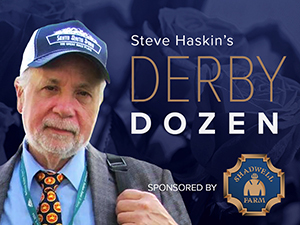 He has a lot of catching up to do, being well behind the other top contenders, and if he can manage to knock off Bolt d’Oro, look for him to catapult to the top of most Derby rankings, despite having only three career starts. Even if he can give him a stiff test it will reassure his backers and prove to his doubters that he is capable of defying the odds and can run huge in the Kentucky Derby. The truth is, we have no idea what this magnificent athlete is capable of. We haven’t seen anything quite like him; the closest being Big Brown or Curlin, who both went into the Derby with only three career starts. But Big Brown raced two turns at 2 and ran against a far weaker group in the Kentucky Derby than Justify will face. And Curlin actually used the Derby as a prep for his victory in the Preakness. If Justify winds up winning the Kentucky Derby he will join Big Brown as the only two horses to win the Run for the Roses off three lifetime starts in the past 103 years. Logic says Justify should not be able to handle a top-class horse as talented and experienced as Bolt d’Oro, but that is what makes him so intriguing. There are some who, after seeing his two races and his works, feel he has no limitations and can beat anyone. In short, it would not be a shock by any means if he beats Bolt d’Oro, as monumental a task as that would seem to be. We discovered one, possibly two, potential superstars last weekend. Now we’ll find out if we have another. He’s keeping sharp with a five-furlong work in 1:00 2/5 for the Blue Grass Stakes. After the first half-dozen horses, it’s a pretty tightly bunched group, with a plethora of top-class horses who are not looked at with the same reverence as those in the top 6. But horses like Quip are still very dangerous and are improving at the right time. This colt makes a great impression visually, and just has a look of class about him. His pedigree is fine, but nothing that is going to make you feel 100% sure he will handle the mile and a quarter with no problem. But his sire already has a Derby winner in Funny Cide to his credit and his dam is a half sister to Normandy Invasion, who ran a good second in the Wood Memorial before making what looked to be a winning move in the Kentucky Derby, only to tire a bit and wind up fourth. Quip’s broodmare sire Indian Charlie finished third in the Kentucky Derby as the 5-2 favorite after winning the Santa Anita Derby, and never ran again. If he runs a good solid race in the Blue Grass and is right there, don’t fall asleep on this colt come the first Saturday in May. He worked five furlongs in :59 4/5 in preparation for another trip back to Oaklawn for the Arkansas Derby. Despite all the challenges he presents with his inconsistencies in the morning and in his races on occasion, I am moving him up a notch because he now climbs up in the Baffert pecking order with the physical issue that has befallen McKinzie. And if Justify proves he is not the super freak most people believe he is, then he could become Baffert’s main Derby hope. All he needs to win the Arkansas Derby is to move forward off the Rebel Stakes and run a mistake-free race and have better racing luck. In the Rebel, he ran spotty and again didn’t change leads, but likely would have been closer had he gotten a clear run turning for home. I still would like to see him either on the lead or pressing the pace. He is such a strong grinder type he will keep coming at you without getting tired, but lacks that quick turn of foot or big late closing punch, so you don’t want to see him too far off the pace. Just have him go at a steady clip and run horses into the ground. He is tough enough and game enough to hold off horses, so you would like to see him on the lead by the eighth pole. Like Audible, he is not a big work horse, and also like Audible, you probably don’t want to hold his last work, a half in :49 4/5 against him, even though the rider on his workmate kept looking for him, as if trying to get him to catch up, which he couldn’t do. He then shut it down after the wire. He doesn’t ‘wow’ you, but he shows up in the afternoon. I still can’t understand why he was beaten so badly in the Holy Bull Stakes, but he at least gave an indication that was a race to ignore by coming back and winning the Gotham Stakes. It could just be that Gulfstream is too hard for him, as he seems to like a deeper track with some give to it. He does everything in workmanlike fashion, and no one is going to get overly excited about him by anything he does visually. The jury is still out until we see what he can do in the Wood Memorial, as we certainly can’t judge him off his works. If you’re looking for a classy pedigree, his sire, dam, and broodmare sire combined to win or place in 21 grade 1 stakes (10 wins and 11 placings), almost all of them at 1 1/8 miles to 1 1/4 miles. As I said, he is not going to dazzle you with his quickness or brilliance, but he will run hard every step of the way. What’s this, a Derby horse with nine starts already, eight of them at a mile or longer? What kind of old fashioned horse is this? He’s practically ready for the breeding shed. Yes, we occasionally do find that rare horse on the Derby trail that you can actually get a handle on based on his race record. We do know he can close, he is improving, and he’s in great hands. Boy, would he love it if Dale Romans was serious about running Promises Fulfilled in the Derby. This former grass horse has finally found his niche as a deep closer. He needed those grass races and the Sham Stakes, in which he was very rank early, to discover just who he is and how he is most effective. Kent Desormeaux is a good come from behind rider who is willing to take chances, but even he had the good sense to circle the Louisiana Derby field at the risk of losing all that ground rather than try to guide this horse through the field the way he was flying from the back of the pack. Whether or not he is good enough to win the Kentucky Derby, he’s not the kind of horse you want to leave out of your exotics, especially if there is a fast pace. To be honest, all these horses who will be going into the Kentucky Derby off three and four career starts can drive you batty, because they are extremely talented, but bucking a century of history. And it is just a lot to ask such inexperienced horses to go 1 1/4 miles in a 20-horse field. But times are changing, and this no doubt is a very talented horse. Kudos to WinStar Farm for owning four horses (in partnership) in the Top 12 and breeding three of them. Like his stablemate Magnum Moon, as well as top contenders Justify and Hofburg, he will go into the Kentucky Derby off only four career starts. But he at least did sneak in a race in December, so he has run at 2. His running style is typical of most Pletcher horses, stalking the pace. He did look beaten in the Louisiana Derby after apparently striking the front too soon and opening a clear lead, but battled back to win by a neck. What concerns me the most about him is having six weeks to the Kentucky Derby and only the four career starts under him. But he at least has been involved in two close finishes, so he has been able to get battle-tested, something that should come in handy in the Derby. To show how fate can dictate one’s fortune, when 86-year-old Joe Peacock and his son Joey, who have never had a graded stakes winner, consigned Runaway Ghost to the yearling sale they put a $250,000 reserve on him and the bidding stopped at $240,000. “I was a wreck,” said Joey, who watched the sale with his father in their office. “When the bidding stopped I said, “Oh my God, could we be this lucky?” As it turned out, five minutes later, an offer was made for the full $250,000, but Joe Sr. turned it down, saying, “Nope, he had a chance to buy him and didn’t. We’ll just bring him home and race him ourselves.” As Joey said, “It was meant to be.” He admits it would have been very tough to watch this colt, who they bred, along with his dam and granddam, go to the Kentucky Derby owned by someone else. It has only taken Joe Peacock Sr. five decades of owning and breeding horses to become an overnight sensation at age 86. And they did it with their pride and joy Rose’s Desert. Here is a mare who was bred and raced solely in New Mexico who has a horse going to the Kentucky Derby, has a 2-year-old colt by Curlin with Todd Fincher, a yearling full sister by Ghostzapper, is due to foal a colt by Mineshaft on April 22, and is booked this year to Bernardini. Talk about coming up in the world. And Runaway Ghost and his brother are the only two horses the Peacocks have in training. There is a good chance Runaway Ghost, at No. 12, will not remain on the Dozen after next weekend’s three big stakes, but whether you like this horse’s chances or not, these are the kind of stories you have to love and the kind of people you want to root for. Oh, yes, this is a pretty darn talented horse who was extremely impressive winning the Sunland Derby. As if we won’t have enough question marks surrounding this year’s Derby, we now officially have to figure out what to do with GRONKOWSKI after he earned his way into the Derby with his second victory in the three-race series known as the European Road to the Kentucky Derby. By winning the one-mile Burradon Stakes at Newcastle in England in impressive fashion, the son of Lonhro is now definitely heading to Churchill Downs. It was originally the plan to run the colt in either the Wood Memorial or Blue Grass Stakes, but it was decided to keep him home and go for the final race in the series, which he won drawing clear late to win by 1 1/4 lengths over a synthetic surface, on which he is now four-for-four. How he will handle dirt for the first time is anybody’s guess. In a bit of irony, Gronkowski’s paternal great-great-grandsire Sir Tristram in 1974 became the first European-trained horse of the modern era to run in the Kentucky Derby. The son of English Derby winner Sir Ivor had run three times in France, his final race coming in the one-mile Prix Omnium II, in which he was beaten a neck, but disqualified to third. Unlike Gronkowski, he actually did come to the U.S. for his final prep, finishing seventh in the seven-furlong Stepping Stone Purse at Churchill Downs behind eventual Derby winner Cannonade. In the Derby, Sir Tristram pressed the early pace, but tired to finish 11th of 23 runners at 25-1 under Bill Hartack. The big question was what to do with MCKINZIE after his soundness issues were announced. With him out of the Santa Anita Derby and now the Kentucky Derby, that is a huge loss, shades of Mastery last year. You hate to lose a horse of this quality who showed so much progress, and who has a tremendous story behind his name, which has to make it even more crushing a blow for Bob Baffert, who said he was really looking forward to getting his owners Mike Pegram, Karl Watson, and Paul Weitman back to the Derby. But Baffert said McKinzie is a lanky colt who can use more time, and he is expecting to have a big horse later for races like the Travers and Haskell. With McKinzie sidelined and Solomini now heading to Arkansas, Baffert will run RESTORING HOPE in the Wood Memorial. You rarely see workouts at Santa Anita listed as breezing, but Restoring Hope’s five-furlong work in :59 4/5 was indeed listed as breezing. With all the talk around Baffert’s big horses all winter, this colt has been way under the radar, but he keeps improving and has to be taken seriously. He didn’t make the earnings cut to get in the Sunland Derby, so now he will try to earn a spot in the Derby going through New York. I was really impressed with his career debut, in which he was beaten a nose, and it looks as if he is now is coming into his own. When that :21 4/5 opening quarter of the Florida Derby was posted and the riders on STRIKE POWER and PROMISES FULFILLED were riding their horses like it was six-furlong match race, you could kiss their Derby chances away right there. Let’s just say that was pure suicide. Not the best strategy for your final prep for the Kentucky Derby. Dale Romans, however, said the Derby might still be in play for Promises Fulfilled despite his 35-length defeat. Romans is hoping to earn a spot in the Derby with FREE DROP BILLY, who breezed five furlongs in 1:01 4/5 for Saturday’s Blue Grass Stakes. The horse that emerged out of the Florida Derby as a legitimate Derby horse was runner-up HOFBURG, who had impressed people with his maiden victory from the disastrous 11 post, in which he was wide all the way. Dropping some 15 lengths back in the Florida Derby, he was one of the few horses who escaped the blistering early pace. Although he ran like a seasoned pro, and was striding out strongly through the stretch, you still have to remember that this was only his third career start. But when Bill Mott and Juddmonte Farms do something this out of character, you have to pay close attention and take them seriously. This is the year of the lightly raced upstarts trying to buck history by going into the Kentucky Derby with only three or four career starts. They include Justify, Magnum Moon, Noble Indy, and Hofburg. Well, there is another you might want to pay attention to and he runs in Saturday’s Wood Memorial. His name is KING ZACHARY, yet another from the barn of Dale Romans. This good-looking son of Curlin broke his maiden impressively at Gulfstream March 18 in his third career start and first start around two turns. Stalking the pace, he drew off without being touched with the whip to win by almost eight lengths. His mechanics are as good as any young horse I’ve seen this year. He carries his legs under him perfectly and he kept a perfectly straight course down the stretch. He is light on his feet, with no wasted action. Whether he is ready to take on a big field of proven graded stakes horses we’ll soon find out. It’s asking a lot for him to finish first or second in order to assure a spot in the Derby, but from what I saw in his maiden win, he has all the tools. And his pedigree top and bottom is inundated with class and stamina. Owner Tom Conway, who, along with his son Jack, former Attorney General of Kentucky, sent out Stately Victor in the 2010 Kentucky Derby following a 40-1 upset in the Blue Grass Stakes. Conway named King Zachary after Zachary Thompson, the 16-year-old son of a very close friend who suffered a hypoxia-related injury at birth, and Zachary Boone, one of his eight grandchildren. King Zachary tuned up for the Wood with a sharp five-furlong work in 1:00 4/5. It took a while, but FIRENZE FIRE finally returned to the work tab 17 days after finishing fourth in the Gotham Stakes, breezing a half in :50 1/5. Last year’s Champagne winner is still trying to prove to everyone he can win going two turns in spite of being by the sprinter Poseidon’s Warrior. He does have plenty of stamina in his female family and was second in the mile and an eighth Withers Stakes. SPORTING CHANCE, who will now run in the Blue Grass Stakes following his fifth-place finish in the Rebel Stakes over his home track, tuned up for the race with a sharp five-furlong breeze in :59 1/5, fastest of eight works at the distance, then followed that up with a half-mile drill in :48 2/5. Trainer Wayne Lukas said he still may very well point Risen Star Stakes winner BRAVAZO to the Kentucky Derby, despite his disappointing effort in the Louisiana Derby. History has shown us that horses don’t win the Derby coming off poor efforts in their final prep. Bravazo worked a half-mile in :48 3/5. With Audible running such a big race in the Florida Derby, you can bet there will be support for VINO ROSSO, who made Audible look bad in their most recent work in company. John Velazquez has always been high on this horse, and I am expecting a huge rebound effort after his disappointing performance in the Tampa Bay Derby. Stablemate MARCONI, who was ranked in the first Top 12, despite being only a maiden winner, will try to earn his way into the Derby when he contests the Blue Grass Stakes. He is still learning, and we’ll see how much progress he has made. It will be interesting to see how INSTILLED REGARD fares against Bolt d’Oro and Justify in the Santa Anita Derby. This horse has been in the Top 12 almost every week, and I still have faith in his ability to be one of leaders of the division. He just has to return to his form from the Lecomte and the Los Alamitos Futurity. His five-furlong work in 1:01 2/5 was very smooth, and we’ll see how the Santa Anita Derby shapes up. Don’t be surprised to see him run a huge race and be right there coming down the stretch. His pedigree is as strong as they come, and if he can get through this race and earn a place in the Kentucky Derby, he will be a horse to reckon with. Also working for the Santa Anita Derby was PEPE TONO, who drilled five furlongs in 1:01 1/5. Former Top 12 horse FLAMEAWAY worked a half mile in :48 3/5 for the Blue Grass Stakes. Working in company with the top-class 4-year-old filly Salty, he was unable to catch her, finishing a half-length behind at the wire. As I’ve been saying, his best weapon is his tenacity on the lead, and I believe he is more effective in front than trying to catch another horse. We’ll see what strategy Mark Casse uses on Saturday, as he tries to teach him how to be a Derby horse. And the early lead is not where you want them. But he is the kind of horse you probably want to be on the lead turning for home or in the upper stretch. Breaking from way out in post 12, he will either have to gun for the lead or, like Good Magic, take back and hope he can rally from off the pace. If they take back. we'll find out if he is capable of catching horses. One of the more intriguing horses running this weekend is MACHISMO, who was entered in the Blue Grass Stakes, but will likely shift gears and go to the Wood Memorial, according to DRF, after drawing post 11 at Keeneland. Coming off a solid fourth in the Fountain of Youth and improving with every race, you have love his story. Purchased as a yearling for $500,000, he was sent to Todd Pletcher by his ubiquitous owners WinStar Farm, China Horse Club, and SF Racing, and finished out of the money in his first two starts as the favorite. Apparently, that was all the owners needed to see. They put him back in the sale in November and this time he brought only $140,000, purchased by Ron Paolucci, who turned the colt over to trainer Anthony Quartarolo. When Paolucci was asked why he named a lesser known rider, Jake Radosevich, to ride the colt in such a big race, his explanation on Twitter was priceless: "People are asking why am I riding Jacob Radosevich in such a big spot, answer -- he was the horse that was given up on, trained by a guy nobody ever gave a fair shot to, and owned by a guy everyone thinks is crazy -- seems like a perfect fit to me." Bottom line: this is a real nice horse who ran a much better race in the Fountain of Youth than it looks on paper. Another horse I am keeping a close eye on the following week is COMBATANT, who turned in a bullet five-furlong work in 1:01 1/5 for the Arkansas Derby, fastest of 10 works at the distance. One day this horse is going to get things his way and pop a big one. One amazing breeding item that is worth mentioning is that the one-two finishers of the Louisiana Derby, Noble Indy and LONE SAILOR, combined have Secretariat in their first five generations a total of seven times. Lone Sailor is inbred a remarkable four times to Big Red and Noble Indy three times. It is great to see Damascus have so many influences on the Derby trail this year, as his line has been diminishing. Those who have Damascus in their pedigree are Audible, Bolt d’Oro, Justify, Mendelssohn, Enticed, Flameaway, Runaway Ghost, and Combatant. That is six of the Top 12 horses and four of the top six. A field of eight to 10 is expected for the Wood Memorial. They are Enticed, Firenze Fire, Restoring Hope, Vino Rosso, Old Time Revival , King Zachary, California Night, Evaluator, and American Lincoln. MASK, winner of the Mucho Macho Man Stakes, and GREYVITOS, winner of the Springboard Mile, both turned in excellent works for a possible start in the Lexington Stakes. Mask breezed a half in a bullet :48 at Palm Meadows, fastest of 54 works at the distance, and Greyvitos worked seven furlongs in 1:27 4/5.